CARL Book Beacon: Looking for something to watch this weekend? Check out these new BBC DVD purchases! Sam Tyler (John Simm) is hit by a car in 2006 and wakes up back in 1973. It's not just your typical time-traveling cop show. There's plenty of action, great cases to be solved, including the mystery of why Sam is trapped in the past and how he can get home. The show also deals head-on with the sea of difference between modern attitudes and modern police work, and those of a bygone era. Sad the American version ended too soon, or disappointed with the production? This may be the weekend TV escape for you! And if you like it, watch the BBC America schedule for the follow-up series, Ashes to Ashes with Gene, Ray, Chris and the gang as they take on crime in 1980's London. 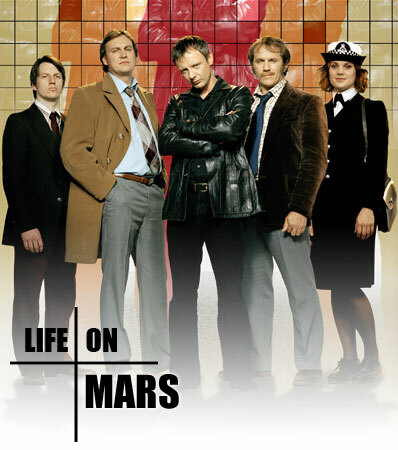 Click here for more info on Life on Mars. Click here fore more info on Ashes to Ashes. Have you been going through Time Lord withdrawal? If you miss having adventures with your favorite time-traveling alien, or just wonder why this fellow's space ship looks like a blue police box, pick up The Complete Specials for five episodes of adventure and daring-do from the number one British family show. The Doctor (David Tennant) meets... The Next Doctor, travels to a desert planet with a world-renowned thief, discovers the secrets of The Waters of Mars and sees the return of his greatest enemy, The Master (also played by John Simm in this very different role) and his people's greatest hero (Timothy Dalton) in five fast-paced adventures. Watch them for the fun of it, or get caught up before the new series, with the latest Doctor (there've been 11), Matt Smith, starts on BBC America April 17th. Click here for more info on Doctor Who. Looking for some more grown-up television? This adults-only comedy chronicles the relationship successes and failures of a group of friends. They face a variety of familiar issues: meeting the parents, laughing inappropriately at funerals, buying furniture for the first time as a couple... finding the right way to tell your boyfriend that there are bars named after you in Australia. Normal, every-day things. Looking for a grown-up laugh on a rainy weekend? Want to see what Steven Moffat worked on as a writer before he became the new producer of Doctor Who? This could be the TV DVD set for you. Click for more information on Coupling. Looking for more British TV? Check our catalog! If we don't have it, we can borrow it from another library, or purchase the materials.